Stephen Lambe is a co-promoter of the Summer’s End Progressive Rock Festival, a promoter of the band Magenta, the Secretary of the Classic Rock Society, and a writer for Rock Society magazine. His book “Citizens of Hope and Glory” was originally published in 2011 and the second edition only recently released with a few updates. 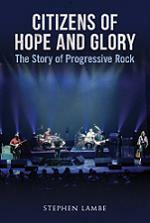 The title makes the book sound like a historical account of the progressive rock, and that the book covers the history of the genre from its inception in the late sixties all the way up to its present revival and even mentions albums from 2013 made it seem like it might be one of the best books out there on the subject of prog. But it was not exactly what I had hoped for. As author Stephen Lambe explains in the beginning, the story is told largely by mentioning important bands and their albums with “gateway” albums being given a brief review. The actual development of the musical genre comes together by explaining which band was doing what to contribute to it. In this way, if one wanted to, you could buy or listen to all 64 “gateway”albums reviewed in the book as companion pieces to the book and you would have a very clear picture of Lambe’s journey and experiences with progressive rock. The story unfolds well enough but for me it was a little too casual and light and never dug deep enough. Additionally, the perspective is British and mostly looks at symphonic prog bands. Regarding the former, a great many of the bands and artists mentioned are British and the state of the genre is largely seen as growing or failing based on what was happening with the music scene in Britain. There is plenty of room made to mention American, Italian, Scandinavian, European and Eastern European bands as well, but I felt there were some notable gaps such as Rush not getting mentioned until 1981’s “Moving Pictures” and Saga not being mentioned at all (my Canadian perspective). Uriah Heep are also often listed as one of the big heavy rock prog bands of the 70’s but their name appears only once, if I recall correctly. As for looking at symphonic prog mostly, it is fair enough, but, as Lambe admits, that means other genres are given only a paragraph or two and many significant bands are hardly mentioned if at all. The rise of progressive metal is treated very briefly. For the reasons stated above, I would say this book is more like reading about a friend’s love and passion for the music and learning about how he has experienced it rather than a comprehensive historical account. And Lambe does not deny his personal approach. He out rightly admits that this is his book about progressive rock, his journey. What I really enjoyed while reading the book was the feature of many albums that Lambe felt were worth mentioning. Of the 64 albums given a review, I had 20 in my collection already and another 20 I had already placed on standby in my Amazon account. This meant that Lambe and I shared roughly two thirds the same musical taste so it was easy to understand where he was coming from. Many of his opinions and experiences with the music paralleled mine, most notably his original regard of Peter Hammil’s vocals and how he came to accept them and even appreciate them. Hammil’s vocals kept me away from Van der Graaf Generator’s albums initially, too. Now I understand them much better. As for the albums I didn’t know, it has been fun checking some of them out in an effort to find new music that I might enjoy adding to my collection. Of course as a book chronicling the story of prog, there are plenty of short background stories and anecdotes about artists and albums, and there is a decent reference list at the end, plus a lot of photos of artists and bands then and now, including a colour photo section. The book also includes chapters on topics such as the evolution of equipment and recording technology, concerts and festivals, the DVD concert, vocals and lyrics, and so on. At first I found the placement of these chapters puzzling and intrusive. While reading about prog in the late seventies a new chapter begins on progressive rock live that takes us from the 70’s to the modern stage show. Then we go back to the history of the music in the following chapter. Later on I understood what was going on as more such chapters appeared. Overall it has been a fun book but a very easy one to read. I learned some new things and I have picked up on some new albums and bands to check out, plus I have given a second chance to albums that I previously wasn’t interested in, sometimes finding that my hunch was right and other times finding that I might just like them after all. As for really learning about an in-depth behind the scenes of progressive rock I feel there must be a better book out there. Two out of five stars for not living up to my expectations but four out of five for being an enjoyable book nonetheless.